Unfortunately, this is how many parts of the world look. 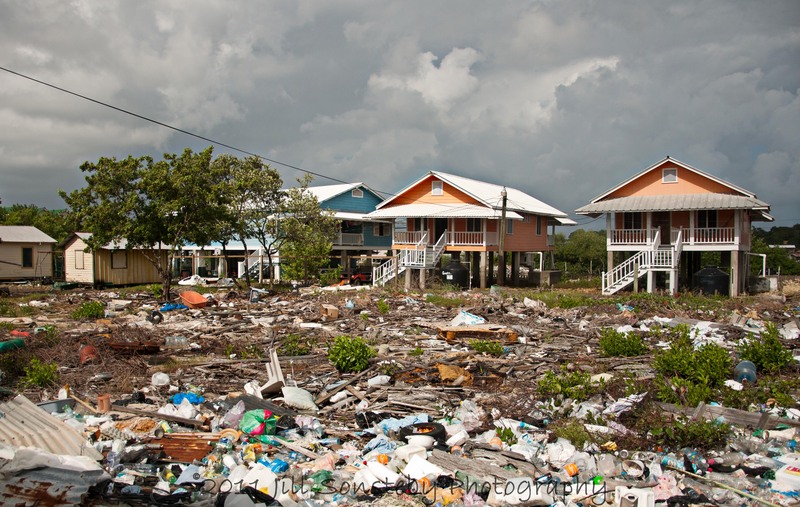 A piece of land in the middle of many houses becomes the garbage dump and serves as a landfill. Unlike the American way of landfills where there are layers of dirt mixed in with the trash, this trash is just sitting on top of the water mixed with rocks, shrubs and muck…giving you that lovely trash field for a backyard. I am researching ways to recycle this plastic that is so readily found on all the shores here in Utila. If you are have any ideas for helping with this plastic problem, please let me know. Like so many beautiful spots around the globe, it is difficult to comprehend that the local people trash their own backyard. Foreigners come and do a clean-up, but shouldn’t bother because two weeks later it looks like nothing was done. On second thought, someone needs to care what happens to our planet. Great picture to illustrate an ongoing problem. It’s a big challenge to think about helping people think different about their environment and stewarding things better. Love the houses, but not so much the backyard! Ugh…terrible. I wish I can help you with recycling tips…but I don’t know anything about it. I know it’s a bit sad.